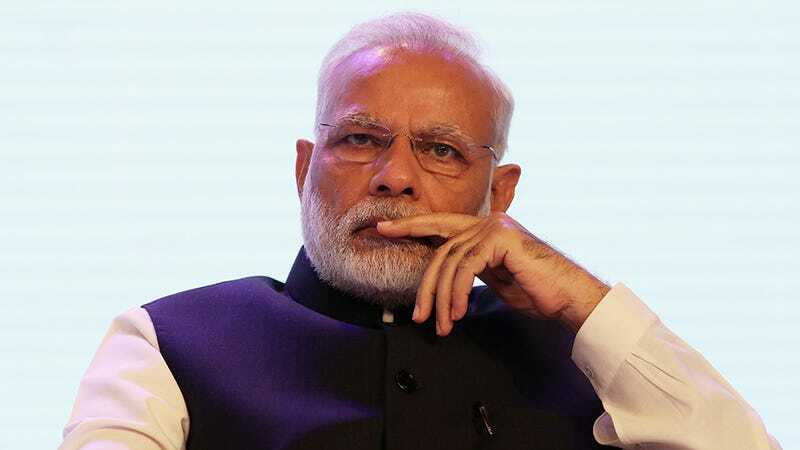 Narendra Modi, Prime Minister of India, has an economic firestorm on his hands following his decision to ban the 500 and 1,000 rupee notes. In his monthly address on Sunday, Modi took his ambitions further with a call for a cashless society. The ban has removed 80 percent of the country’s currency from circulation and brought commerce to a virtual standstill. But rather than backing up, it appears that Modi is doubling down. “We can gradually move from a less-cash society to a cashless society,” he told listeners. The initial decision to ban the two notes is part of an effort to cripple a robust black market economy. Modi said that counterfeiting was rampant and claimed that the ban would aid in the fight against tax-avoidance, bribery and the funding of terrorism. He admitted that “a 100 percent cashless society is not possible,” right now, but emphasized that he wants to set the wheels in motion. Credit Suisse estimates that 90 percent of transactions in India are conducted in cash. Not only would a move towards a cashless society be a tough logistical hurdle but a cultural one as well. There isn’t really a strong install base for digital payment methods in India and people aren’t familiar with how to use them. Modi urged younger people who understand technology to teach the less-savvy. While it seems likely that a move towards a cashless society would be an extremely long-term project, Modi has demonstrated his willingness to make bold decisions with immediately negative consequences. Even if dramatic measures are taken, digital payments bring a host of problems of their own—security breaches, privacy concerns and virtual black markets to name a few.